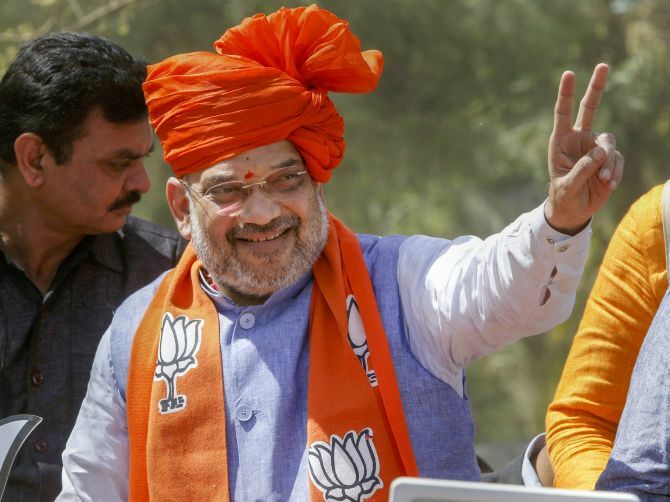 Bharatiya Janata Party chief and the party's Gandhinagar contestant Amit Shah Saturday held a roadshow in Ahmedabad, where he made people chant a slogan that "entire Kashmir belongs to us". His slogan-chanting comes in the wake of Peoples Democratic Party chief and former Jammu and Kashmir chief minister Mehbooba Mufti's criticism that Shah was "daydreaming" about abrogating Article 370 of the Constitution that provides special status to the state. Shah held the roadshow in the city as part of his election campaign, which comes on the day of his party's 39th foundation day. Before embarking on the roadshow from Sarkhej area in Ahmedabad around 9 am, Shah garlanded the photographs of Jan Sangh founders Deendayal Upadhyaya and Syama Prasad Mookerjee. Shah made the people present there chant, "Jaha hue balidan Mookerjee, woh Kashmir hamara hai... Sara ka sara hamara hai (Where Mookerjee sacrificed his life, that Kashmir is ours, that entire Kashmir is ours)." Reacting to the reported remarks made by Shah underscoring the BJP's commitment to abrogate Articles 370 and 35-A, Mufti had recently said if the constitutional provision was removed, mainstream politicians, including her, will have to reconsider their future course of action. "I want to tell Amit Shah that you are daydreaming if you think you will abrogate Article 370," Mufti had said. Shah conducted the roadshow in an open vehicle with BJP's state unit president Jitu Vaghani. It covered several parts of Ahmedabad city that falls under the Gandhinagar constituency. Apart from Vejalpur, Anandnagar, Jivraj Park, Mansi Cross road areas, the road-show also passed through the Muslim-dominated Juhapura area. It ended at Haveli in Vastrapur area around 1 pm. The roadshow covered both rural as well as posh city areas, where people came out to greet Shah despite the scorching heat. The BJP chief reciprocated by waving his hand at them throughout the roadshow, which covered around 10 km. Shah is scheduled to hold one more roadshow on Saturday evening in Sabarmati area of the city, which also falls under Gandhinagar constituency. Shah, a Rajya Sabha MP from Gujarat, is expected to hold interactions with party workers in Bopal area of his constituency at night. The former Gujarat minister has replaced BJP veteran L K Advani, who had been winning uninterrupted from Gandhinagar since 1998. This is Shah's maiden Lok Sabha election. 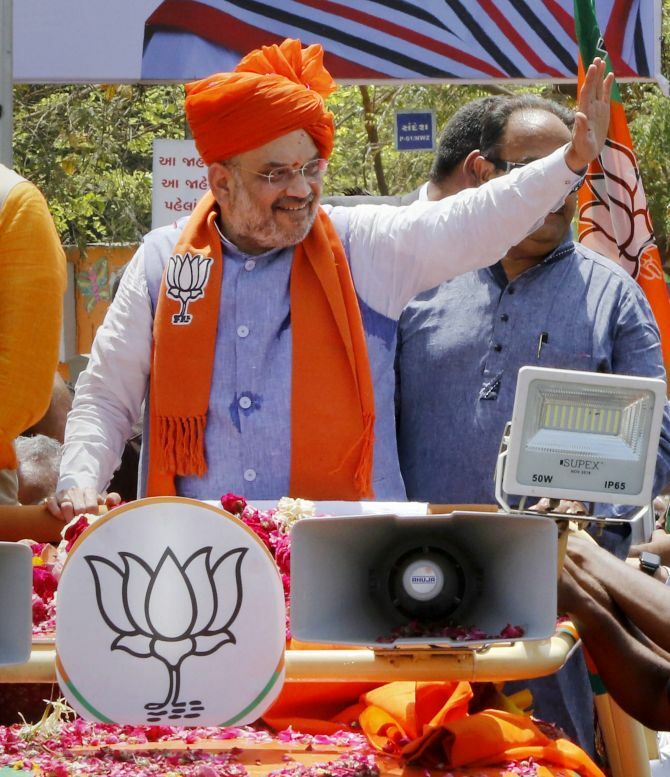 The BJP chief had filed his nomination last Saturday in presence of Union Finance Minister Arun Jaitley, Home Minister Rajnath Singh, Shiv Sena chief Uddhav Thackeray and Chief Minister Vijay Rupani.